Beverly's Official Blog | News and findings from world of crafts, scrapbooking and more: A Giveaway! 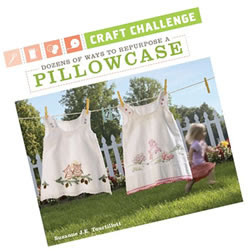 Beverly's in Rocklin had Katie Trott in for a book signing last Saturday for her craft book - Craft Challenge: Dozens of Ways to Repurpose a Pillowcase. And we have a signed book for you! Please leave us a comment telling us about your latest "repurposing" craft project and you could win this terrific book. We'll draw a winner on Friday. Also, Katie will be giving a class at Beverlys in Rocklin on Saturday, August 1st, 10am – 12pm. The cost of the class will be $15. Please bring your own sewing machine. Sign up at the Rocklin store. I re-purposed this old sweater into a new sweater coat using scissors and some crochet! If interested you can check out my blog post. In my daughters kindergarden class we used old pillow cases to make Indian costumes. They looked super cute because the kids painted Indian symbols on them. My most recent repurpose was using those clear plastic containers strawberries come in. I added some pattered scrapbook paper to the outside and lid top to cover the label. I lined the inside with tissue paper and added some fresh baked mini muffins. It was a nice gift to give. I love using vintage (or just old!) sheets for the backs of my quilts. A lot of the prints are really fun and it adds an unexpected element to my quilts. Love that. I've been working on repurposing all sorts of different gift boxes (and making them pretty by covering them with fabric, etc.) to store various mementos in. Working well so far, so fingers crossed! I re-purposed old scrabble tiles and made magnets, I've also been crocheting a rag rug out of old sheets. Fabric Applique Class in Ukiah!